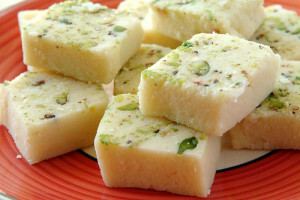 Barfi: Barfi (burfi, burfee or borfee) is a sweet confectionery from the region of South Asia. Plain barfi is made with condensed milk and sugar cooked until it solidifies. The name is derived from the Persian word Barf which means “snow”, since Barfi is similar to ice/snow in appearance, this is why it is served cold. Barfi is now served in many countries in South Asia year round but especially during the holiday season, wedding ceremonies and the religious festivals. 2 tbsp almonds- blanched, peeled and halved. Heat the ghee (1 tablespoon) in a pan, on medium heat. Roast the khoya, on medium heat, till it turns light pink in colour. Let the khoya cool down to the room temperature. Mix the sugar with 50 gms water, to make the sugar syrup. Cook the sugar syrup till the 2 string consistency is reached. Stir continuously, to bring down the temperature of the sugar syrup. As the sugar starts to set, add in the cooked khoya to the syrup. Grease a tray with the remaining ghee. Pour the mixture in the greased tray and spread it evenly into it. Garnish the mixture with almonds and pistachios. Let the barfi cool down to room temperature. Once the barfi sets, cut it into the desired shape and size. If you have any queries regarding the Barfi recipe, please leave a comment.